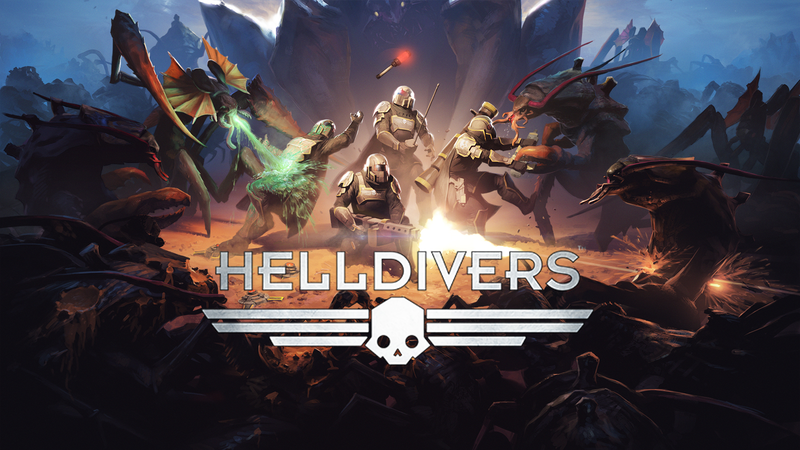 Helldivers is a four-player co-op top-down shooter developed by Swedish game company Arrowhead Studios, the same studio behind Magicka and the recent Gauntlet. Helldivers is published by Sony Computer Entertainment (SCE) and is a part of Sony’s Spring fever sale, which is meant to showcase indie games. From Helldivers’ showing at past events it earned a reputation of being extremely difficult. Just because its called “Helldivers” doesn’t mean that it will be difficult, right? The Helldivers are Super Earth’s defense against an alien invasion. The Helldivers sole purpose is to spread ‘managed democracy’ throughout the galaxy; which has become a pseudo -religion for Super Earth. This is about as deep as the plot goes, but the story isn’t why you should be playing this game. Think along the lines of if Gauntlet married Starship Troopers: their offspring would be Helldivers. The game isn’t hung up on being too serious as the player-characters drop cheesy action movie one-liners throughout missions, and the codex entries are especially humorous. Even though Helldivers can be difficult, most of that is self-imposed. The game does a good job of easing you in and teaching you the mechanics, but after that you’re left to fend and learn for yourself. The friendly-fire cannot be turned off and this alone can make most players give up. What makes this aspect of the game fair is that Helldivers forces the enemies to follow this same principle, so enemies will often end up blowing each other up too. Unlike most shooters, reloading will completely discard the magazine along with any bullets left inside. This creates a need for more efficient use of ammunition. There are no classes to choose from, but characters may be upgraded to fit your own playstyle. With a large amount of gear to choose from, this aspect can make for some interesting combinations. Some of the most fun I had was patrolling in my mech suit and providing protection to my team during a mission. With limited room in maps, calling in equipment can become very dangerous in four player co-op. Armored vehicles and mini-gun turrets are very helpful, but also often lead to many humorous accidental deaths. Helldivers has a pretty big learning curve. The early missions are easy enough to solo, but as soon as you reach the higher difficulties, team play is a must. This is logical in a four player co-op game, but when the online component is broken it becomes impossible to advance. Trying to connect to your friend’s game is a serious pain and the game doesn’t allow you to send invites. Sometimes, it is only by sheer luck that you are able to find your friends through the matchmaking system. Since Helldivers is published by SCE, cross-save is implemented, yet although it isn’t a deal breaker this feature doesn’t fully works either. It would just be nice to transfer saves from PlayStation Vita to PlayStation 4. Now to the gameplay bugs. There have been occasions where guns fail to fire at all, which is especially annoying during certain objective which force players to use only their one-handed sidearm. Walking goes to a snail’s pace at times and diving is the only way I know of to fix it so far. I have read more than enough reports on the forums about how switching controllers will cause some players to lose their save files. When Helldivers is fully working it is amazing. It has tons of stuff to do, equipment to unlock, and accidental deaths to be had. It is worth its price tag, yet I recommend that you wait until its fully fixed before purchased. Next Post Is The Order 1886 worth buying?